When thinking about and planning out the high school years it is easy to get caught up in the core subjects like math, English, science, and social studies. Many colleges and universities have specific requirements for certain number of credits in each of those core subjects and electives may get pushed aside. High school is a great time to explore interests. Do you really like art? Maybe you like science? Is there a particular field of science that you really love? Are you gifted with languages? Are you fascinated by another culture and want to study about Russia or China in-depth and learn the language too? Most colleges and university consider the type of electives studied. They are interested in what classes and subjects a student pursues beyond the basics. This information gives more of a picture of the student. Parents and students should choose electives carefully based on the interests and talents of the students as well as keeping in mind the requirements of potential colleges. Boobear knew that she wanted to pursue a music major. Music is her passion and we designed courses for her to pursue her passion. We made sure that she had the minimum credits necessary for each of the required subjects for her first choice school. Boobear and I worked out a course for Piano Performance which included all of her piano lessons, recitals and practice times but also included attending a few concerts. We also created a course called Music History and Appreciation. She studied different musical time periods, read biographies of different composers, and listened to a wide variety of music. Either of the music courses would have met her Fine or Performance Art requirement for her first choice university but we also included Color and Composition from ARTistic Pursuits. My oldest daughter is a creative soul so she also included courses on sewing and we created a course for cooking. Yes these are life skills but they were also ways to express her creativity. She loves to cook and to sew. She had other electives that were more academic such as Logic, Computer Science, and Overview of Psychology and Sociology. Turtlegirl has different talents and interests. She wants to pursue a STEM related degree in perhaps Geology or Computer Science. She also loves languages. She seems to have a gift for languages and her transcript will reflect that with courses including French, Latin, Russian and an extra English class. She’ll have more math and science on her transcript and less social sciences. You won’t find any music classes on her transcript but you will find The Elements of Art and Composition. Generally her electives are more of the basics but that is ok because that is a reflection of who she is and what she wants. Don’t neglect the electives in high school. Don’t be afraid to choose something a little different. Don’t be afraid to limit yourself to what you can purchase in a box. Most of BooBear’s courses were put together using different resources and lots of library books. One of the resources that we found invaluable was Zane Education. We used many of those videos as a jumping off point and supplemented with additional library books. Check out these blog posts from my blogging friends. They are also blogging about Electives in the High School Years! Dawn Oaks at Double O Farms shares Just What Do You Do with Elective Requirements? Do you have a high school student? Do you have a middle schooler and you’re thinking about the high school years? You’ll want to keep watching for the Monthly Homeschool High School Blog Hop! On August 26th, we’ll be talking about math and science! I often start composing my random five posts earlier in the week and aim to post them on Friday because the original link up was Random Five on Friday but often I just don’t get them posted until Saturday. I confess that today I am composing and posting on a Saturday and I’m short one so it’s Random Four on Saturday in place of Random Five on Friday! 1. Last week was very exciting. I really wanted to go to Doxacon Seattle but . . . well life is life. I entered a contest to win a ticket and though I didn’t win, I did get to go. An unknown to me person donated a ticket for me. Tickets at the door for *just* Friday night were only $10 so Honeybear and I went together Friday night. A friend of mine was going on Saturday and I was able to car pool with her. (Thank you Mimi!!). 2. After the general session on Friday evening, we went out on a patio or deck and had snacks, fellowship, and a mini acoustic session of Geek Music from Pangalaticats. My favorite song was Come Along, Pond! The evening was beautiful. I snapped this picture with my phone and then played with it using PicMonkey. I love how the sky was showing bits of the sunset with the swirling clouds. 3. What is Doxacon? Doxacon is where Faith and Truth meet Science Fiction and Fantasy. Doxacon Seattle is a spin off or child of Doxacon Prime. Though it is primarily Orthodox it is open to all Christians and one does not need to be Orthodox to attend. Doxacon provides a means for Christians to come together and discuss the Sci-Fi and Fantasy genres in a Christian Context. 4. I realized at Doxacon I really am a GEEK. I surprised myself. During the second break out session when I was listening to a fabulous presentation called “Time After Time After Time,” I found that I knew nearly every single sci-fi reference. Firefly, Stargate, Doctor Who, Star Trek, and more. I really enjoyed the first break out session as well as “The Cross is a Time Machine and Its Bigger on the Inside.” I picked it solely based on the title and then found out that the presenter was an online friend I very much respect. How cool is that?! It’s been a couple of weeks since I’ve done a Random Five on Friday. 1. Turtlegirl is getting serious about heading to college in fall of 2016. She’s been researching degree programs for several schools, verifying application requirements, and ranking her choices. I guess we’re going to have to schedule some campus visits! 2. I just finished a review of the most amazing and wonderful web based online homeschool lesson planner. I have tried so many different planners and several online ones and I always always always always go back to Homeschool Tracker Plus. 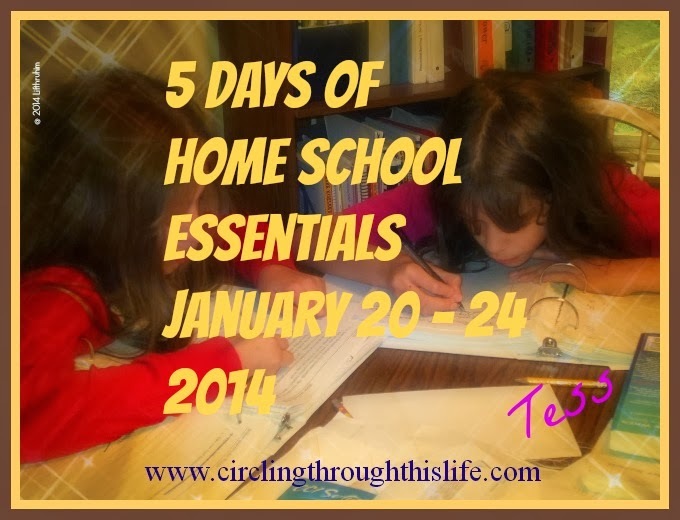 I love Homeschool Tracker Plus but the program is becoming obsolete. HST no longer offers it for sale and now promote their HST Online product. I am completely unfamiliar with it. I have no idea how it compares to Homeschool Planet. I wasn’t even sure I wanted to review Homeschool Planet so I signed up for the 30 Day Free trial and decided that I loved it. I was given a one year subscription in exchange for my review. I can see myself paying for another year when that subscription ends. What about HST +? Well it is still my beloved program and I plan to use it for transcripts and reports but the day to day lesson planning and grading? I will use Homeschool Planet. Homeschool Planet makes adding chores and things like meal plans a much easier process that PLUS (again I don’t know about Online. Online might be streamlined and easier to use that Plus). Check out Homeschool Planet and sign up for a free trial! 3. How does the garden grow? Quite nicely actually! We have one tomato that is nearly rip enough to pick. Honeybear picked two lemon cucumbers and 3 pea pods yesterday. 4. I finished reading another book by Murray McDonald: Divide and Conquer. This moved just as quickly as The God Complex. I was sucked in from the very first chapter. Divide and Conquer is more violent and has more foul language. I prefer less gruesome and I don’t particularly like seeing certain words in print, but I still really enjoyed this book and I will look for the next one in the series. The ending caught me by surprise and I liked having it be twisted. I really appreciate how McDonald gives you clues and lets the reader think she knows what it is all about and then *wham* he throws in something completely unexpected! 5. One of the widgets on Homeschool Planet is for daily quotes. The other day this was the quote: "You prove your worth with your actions, not with your mouth." Jean Paul I am not sure why but it really spoke to me. I think I need to do more and speak less. A few years ago we had the opportunity to read and review one of the books in the Circle C Beginnings by Susan K. Marlow. Recently we received the book Tales from the Circle C Ranch from Circle C Adventures along with Andrea Carter's Tales from the Circle C Ranch Learning Lapbook to review. The Circle C Adventures are the adventures of the independent tomboy Andi Carter growing up on the Circle C Ranch in the 1870s and 1880s. Tales from the Circle C Ranch is a collection of short stories inspired by questions fan would ask Ms. Marlow. It includes stories from the Early Years (Circle C Beginnings) and the In –Between Years (Circle C Adventures). Through her adventures Andi learns lessons about life, family, and faith. The first part of the book is labeled The Early Years. The first story begins before the first book, Andi’s Pony Trouble. It answers the questions of when Andi was allowed to wear overalls and why. There are four stories in this section. Each one is a stand alone adventure and each one clearly states where it falls in Andi’s timeline. Susan K. Marlow generously included a digital copy of the Andrea Carter's Tales from the Circle C Ranch Learning Lapbook. A Journey Through Learning created this educational lapbook specifically for Tales from the Circle C Ranch. Each topic of the lapbook corresponds to a specific story from the book. Some topics include: Britches, Dresses, & Overalls; History of Photography; State Fairs; Pacific Coast States, and more! The Learning Lapbook includes study guides with all the information you need to know to complete the mini-books. The lapbook includes instructions for the mini-books as well as how to put a lapbook together and a placement guide so you’ll know exactly where to place the completed mini-books. There is at least one mini-book for each of the stories in the book. A few of the stories have two mini-book topics. If you are already a fan of Andi and her adventures at the Circle C Ranch you’ll want to add this book to your collection. If you have not yet been introduced to Andi, check out this book. It’s a great way to get introduced to Andi and see how she grows from Circle C Beginnings to Circle C Adventures. Susan K. Marlow also has started a new series about Andi: Circle C Milestones. Tales from the Circle C Ranch is the perfect way to transition to the older Andi. The Crew reviewed book one. Book two should be released soon! NOTE: The Lapbook is available in both print and e-book versions. We received the digital version. When I first saw Homeschool Planet from Homeschool Buyers Co-op on the Schoolhouse Review Crew upcoming list of vendors, I wasn’t all that thrilled. I wasn’t even sure I would be interested. I mean I already had a great planner that I loved. Then I looked at the video. I signed up for the FREE 30 Day Trial to see if maybe, just maybe I could make this work if I had to review it. I fell in love. I went from, well, if I am assigned to review this and I have to make it work, I can to: Please oh Please oh Please let me get assigned to this so that I can have a full one year subscription! This product is amazing and it is so much more than just a homeschool planner. Grab a cup of coffee cause I think I’m going to get a bit more wordy than usual with this review. Oh you don’t drink coffee? Oh ok, I’ll wait for you to get your favorite beverage. I want to share some of my favorite features and some of the non-homeschool ways I’ve been using this planner to plan my life and manage my family’s schedule. Homeschool Planet, the amazing online planner to organize your life, is only available through the Homeschool Buyers Co-op. That means you have to be a member of this buyers club to purchase a subscription. So what is Homeschool Buyers Co-Op? It is a buyers club for home school families. By buying as a group, individual families can get a much better deal on curriculum and resources for their homeschool. Homeschool Buyers Co-op is family owned and operated. It was founded in 2005. Membership is free and there is no obligation to participate in any of the group buys. I’ve been a member for several years. Homeschool Planet is an online subscription based planner to help homeschool families organize both home and school. This easy to use planner allows for separate log-ins for students so they can view their own assignments and mark items complete. You can view information in Calendar, Planner, or Resource. When creating assignments for your lesson plans you can attach documents and web links. You can set up grading as well as tracking attendance. Print assignment sheets or send them by email! There is so much that this planner can do, I strongly suggest visiting Homeschool Planet and watching the video which gives a great overview of the many features of the program. Some of my Favorite Features! I’m just going to list out a few of the features that I have found I cannot live without. Rescheduling Helper ~ This handy tool pops up immediately if you are opening Homeschool Planet for the first time that day in that browser. If you are like me, and switch between browsers or between operating systems, it will pop up the first time it is opened in a new browser even if it is later in the same day. This handy helper displays all the incomplete assignments and tasks and gives you the choice of what to do. You can access the Rescheduling Helper at any time from the drop down Helper Menu at the top. Grading Helper ~ I am so bad at keeping up with grades. I love that the Grading Helper pops up right after I finish with the Rescheduling Helper. I can enter grades for those assignments which are set up for grades. Grading is an optional feature so you do not have to assign grades if you do not want to. I like that I can set up grading for some students but not others and for some classes but not others. I can also customize the weighting and the scale. Shopping List ~ This widget is wonderful! It comes pre-loaded with the names of some stores such as Costco, Wal-Mart, and Target but you can customize it. I keep a running Costco list as well as list for my local grocery store. I love this feature because I can text the shopping list to my husband’s cell phone. I use this feature more often than I want to admit. I can also send the Shopping List as an email! Themes ~ I can change the color layout/theme. I love this feature because it allows me to change up how the program looks and it allows my children to customize the look when they use their log ins. They are not stuck with mom’s choice. Message ~ This widget allows me to type a message and send it to one or more people using either text or email. I use it to send reminders. Much easier to send a text when I can type it at the keyboard! Assignment Generator ~ This makes setting up assignments with recurring patterns super easy! In just a few minutes I can schedule out an entire year’s worth of math assignments. Homeschool Planet does so much more than just help you plan lessons for all your home school classes, you can use it to plan menus, keep track of birthdays and events, or assign chores. I created a person called MENU PLANS. By creating a person called Menu Plans I could sort the calendar and just show Menu Plans without seeing other things like chores or assignments or things I have scheduled for myself. When I set up the menus I click on the calendar and I choose the Everything Else option. This is the option that allows you to schedule things like appointments, chores, sports, music lessons, everything that isn’t a class or an event like a birthday, anniversary, or vacation. This will give me a window that looks very much like adding a class or an event but instead of saying “Class” or “Event” it says “Activity”. I can choose a category from the drop down list or customize it by adding a category of my own. Homeschool Planet already included the category of Meals! How cool is that! I then choose how often the activity appears and I can adjust the time and any other details. I can then begin to fill in my menus. I added a category for Review Crew so that I could set up Review Due as an activity and for the task I could put the name of the review product. I chose to not give it a particular time, just a date and then it shows up on *my* calendar page. I also set up my husband and my oldest daughter with profiles. I could even choose to list them as “not a student.” By including them I could have their email address and phone numbers for texts in the program and I could add their work schedules and appointments to the calendar so that I could know when they would be home for dinner, especially the oldest who is often not home for meals. There is so much flexibility with this program and so many ways that you can use it. I’ve only scratched the surface with some of the ways that I am using this online planner. I encourage you to read the reviews from my fellow crew members to find more ways to use this program. It truly is more than just a homeschool planner. This is the FIRST, online subscription planner that I have ever used *beyond* the trial period. I’ve tried many online planners and found so many to be difficult to set up or they didn’t have the flexibility I needed. So many of them I gave up on long before the trial version expired. Homeschool Planet is different. It works for me. I found this easy to use. The Help Section provides tutorial videos that provide step by step instructions for getting started, setting up student profiles, setting up classes and calendar sharing. This is so easy to use. I plan on renewing my subscription next year. Do check out the 30 Day Free Trial. See for yourself how fabulous this planner is for managing so many aspects of life! Yes, you do need to be a member of the Homeschool Buyer’s Co-Op but that is free and unlike so many other free trial offers you do NOT need to give any credit card information when you sign up for Homeschool Planet. I grew up Catholic and we had prayers and creeds that we memorized but I didn’t really understand prayer. As a young adult in my early 20s I attended a Bible Study group for the first time. I was struggling with Catholicism. I had never prayed with a group like that before. We each took turns praying out loud. It was very uncomfortable for me but l learned how to pray for others and I learned how valuable prayer was for *me*: how profitable it is for my soul and my salvation. I would like to say that after 20 some years I have a rich and solid prayer life but I still have long seasons of inconsistency. I pray every day or most days but not necessarily in a quiet meditative way. Many times it is short little arrows of prayer sent up while I am harried, rushed or stressed. As I’ve grown over the years and as my paradigm shifted my prayers have changed. I’ve been Orthodox just over 5 years now and I am learning about a richness and depth of prayer that I have never experienced before. Yes, I’ve prayed Psalms and Bible passages and yes I went through a “rote prayer is bad” phase for most of my protestant adult life, but I have found value in praying ancient prayers. Using prayers from a prayer book helps me to focus my mind. The prayers are real and from my heart even if the words were written hundreds of years ago by someone else. At every time and at every hour in heaven and on earth You are worshipped and glorified, O Christ our God, You who are longsuffering, most merciful, most compassionate, who love the just and are merciful to sinners, who call all to salvation through the promise of the good things to come. Accept, O Lord, our entreaties at this hour and guide our lives that we may keep Your commandments. Sanctify our souls, purify our bodies, correct our thoughts, purify our ideas, and deliver us from all distress, evil, and pain. Surround us with Your holy angels that, protected and guided by their host, we may attain unity of faith an the knowledge of Your unapproachable glory. For blessed are You forever and ever. Some believe that cursive handwriting is a dying art. Some believe that cursive may not even be necessary to teach anymore. With the use of computers and other devices typing really does seem to be pushing out handwritten notes. Linda Shrewsbury and Priscilla LeCroy founders of CursiveLogic believe that it is still important to teach cursive and that it doesn’t have to be a long drawn out process. Turtlegirl did learn cursive when she was in elementary school but isn’t pleased with her handwriting and more often than not she prints rather than write in cursive so we thought using the CursiveLogic Workbook would help her improve her handwriting. The 96 page, full color, physical workbook is sturdy. It is spiral bound with thick coated covers. All the instruction necessary is include right in the workbook so there is no need for a separate Teacher’s or Instructor Guide. The workbook includes three laminated practice pages that a student can use with a dry erase or wet erase marker. Students who need the practice can then use these pages over and over again to practice the letters and strings. The workbook does include plenty of practice but some students may need more practice. CursiveLogic recognizes that you may want more practice for your students and they provide free PDF practice pages. You can sign up for the CursiveLogic newsletter and get practice pages emailed to you. I’ve also been given links to share with my readers: Printable Ebook Practice Pages. CursiveLogic captures the flow of cursive by teaching all of the similarly shaped letters in a connected string rather than as individual letters. CursiveLogic’s letter strings teach students to connect letters from the first lesson, allowing students to internalize the flow of cursive handwriting even before they have learned all 26 letters. CursiveLogic uses “Theme Colors” and “Verbal Task Analysis” to provide auditory and visual cues to reinforce letter patterns. The program teaches both lowercase and uppercase letters. This is a really neat way to learn cursive but it was difficult for Turtlegirl because she already knows how to write cursive. She found that she preferred to write smaller and that the lines were too big. She’s a bit of a perfectionist and felt that she had less control when she had to write bigger letters. We both feel that this would be a great way to teach younger students and it’s also a great way to teach older students who have never learned cursive. This program requires students to be already printing. I do not recommend this method as a way to teach cursive first. I do recommend this program for students ages 8 and up with solid printing skills who are ready to learn cursive. Last week Turtlegirl and Tailorbear went to an Orthodox Youth Church Camp. We decided to all drive over to Puget Sound together. After dropping off the two girls the rest of us took some time explore an area we’d never been to before. First though we had to stop and get ice cream. Except that we stopped at McDonald’s and the ice cream machine was not working. So Boobear and Supergirl shared a large chocolate shake. Honeybear and I shared a large Iced Coffee. It was a beautiful sunny summer day and we found ourselves at a park near the harbor of one of the inlets of Puget Sound. Here’s just a couple of pictures.